Far Cry New Dawn Details Emerge | Nerd Much? Intrigued by the next installment in the Far Cry franchise? Us too. We got a brief look at the game during The Game Awards last month. But now, we have fresh Far Cry New Dawn details thanks to a Q&A that was recently held over Twitter. Our Far Cry New Dawn details mostly come courtesy of the game’s creative director, Jean-Sebastien Decant. The creative director took burning questions from fans and enlightened the community with some additional insight on the upcoming open-world title. Decant stated that he and his team “pushed what we call the light RPG approach” within the game. He explained that crafting has been bolstered to have ranks which should match up in the game world with the enemies you’ll encounter. He also explained the game’s Prosperity base system. Here you can “rally your characters and invest in order to get better upgrades.” Making it sounds as though it’s a hub location of sorts for the title’s various characters. 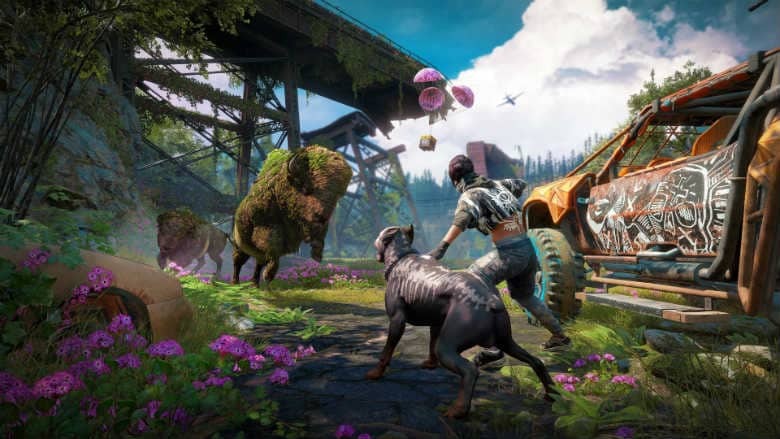 Decant also went on to confirm that Far Cry New Dawn is indeed “a sequel to Far Cry 5.” In fact, it’s the first time in the Far Cry franchise that a new game will continue the story of a previous entry. It was also confirmed that the nuclear fallout incited a worldwide collapse, and was not just a local devastation of Hope County. The developers will utilize this in New Dawn’s story, taking them out of the Far Cry 5locale from time to time on missions in which we see what affects the blast have had on a large scale. They also confirmed that we’ll be reconnecting with certain characters that were fixtures in the story of Far Cry 5. Specifically mentioning Joseph see and Rye family as some we’ll encounter. Hopefully the fresh Far Cry New Dawn details did a decent job satiating that open-world itch. But if not, there really isn’t that much longer of a wait. The Far Cry 5 continuation arrives for PC, PlayStation 4 and Xbox One on February 15th. And with a price of $40, it’s pretty much a must have for any Far Cry fan.